Are you creating a video that you want to publish on your website, but aren’t sure what format and settings to use when you export and encode it? As far as website videos are concerned, before you encode them you need to first decide on the manner in which you’re going to publish them. In particular there are two main ways in which videos are published on websites: A self-hosted or embedded videos. When you embed a video, you actually upload the video to a third-party online video platform and then paste code onto your website to display it there. That distinction is important, because you will want to encode your videos using the format and settings that the platform recommends. For example if you’re publishing a video on your website by embedding it from YouTube, you will want to encode your video based on YouTube’s recommended settings. The same applies to other online video platforms, and by following their recommended settings you’ll ensure that your video is displayed properly. Typically most online video platforms publish their recommended format and settings, including information regarding the frame rate, bitrate, resolution and aspect ratio. However if not the safest format to use is MP4 with H.264, as it is widely supported by most platforms. When you’re publishing self-hosted videos, you need to consider its implications on your available bandwidth. As you’re probably aware videos can be large, and could place a heavy load on your webhost. In some cases you may want to encode videos using a lower bitrate and resolution in order to conserve bandwidth. Alternatively in others you may want to try using formats with better compression rates such as HEVC – but they aren’t as widely supported. Make no mistake, self-hosting videos is definitely more challenging and you will need to carefully weigh your options and decide on the format or video settings that suit your needs best. 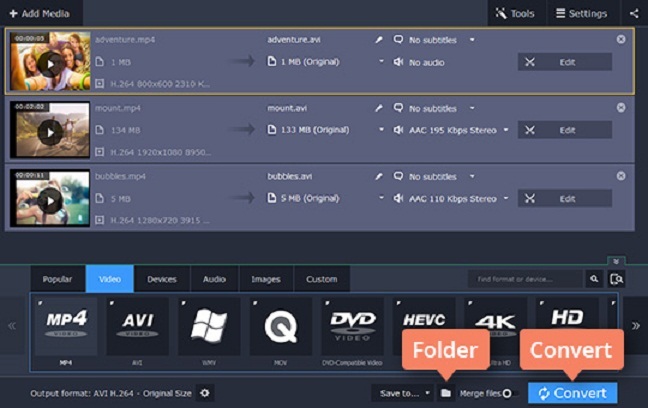 If you’ve already encoded your video, you can always convert the video format and settings later using one of the many converters that are out there. For example you could try Movavi Video Converter and follow the instructions at http://www.movavi.com/support/how-to/how-to-convert-mp4-to-avi.html. All said and done however, the first step is to decide whether you want to embed or self-host the videos as it will simplify the decisions you need to make. If you embed the video then all you need to do is look up the recommended settings, whereas if you’re self-hosting you can start to weigh your options based on the factors listed above.